Aloha Koa Parlor, Other Steel String Guitar from Goodall Guitars. Goodall Guitars has reintoduced its Aloha Parlor guitar model. According to the brand, this new version features a fretboard and bridge built out of Bariensis rosewood -- an extremely hard and dense Pacific Rim wood that is red brown in color. The 25" scale, 14-fret Aloha Parlor model is a 14-inch wide guitar with a compact design but aimed at delivering a full voice. 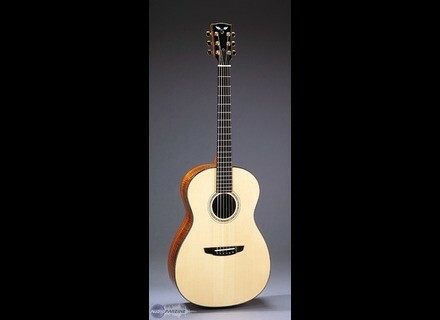 It features either koa or mahogany back and sides, a Sitka spruce top. Stock strings are Elixir Strings' Phosphor Bronze light gauge with Nanoweb coating. The Aloha Koa parlor guitar is available at all Goodall Guitars national and international dealers, which are listed at the brand's website, http://www.goodallguitars.com/. U.S. MSRP starts at $2,995. Radial Engineering [Bones Series] Fullerton Distortion After the success encountered by its Tonebone series, Radial Engineering has announced a new series of guitar effect pedals for guitars: the "Bones".